Some of the first iPhone AR apps were made to measure stuff around your home and office. With iOS 12, Apple gives you a great built-in option. With the introduction of ARKit in iOS 11, Apple put a stake in the ground in the mobile Augmented Reality race. Some of the best early AR apps used your phone to measure linear distances—a digital tape measure, if you will. With iOS 12, Apple is expanding it’s Augmented Reality capabilities with ARKit 2, and has built-in a new utility app called Measure to show what Augmented Reality can do. It’s a simple app that reliably measures linear distances, and obsoletes some of those early, simple AR measuring apps. Note that Measure requires ARKit, which is not supported on every device that runs iOS 12. You’ll need an iPhone 6s or later, an iPad Pro, or a 2017 or later iPad. After you launch the Measure app, you’ll be prompted to slowly move your phone around your environment. This is ARKit getting a sense of your surroundings, so it can gauge distance to objects, figure out where surfaces are, and orient itself. 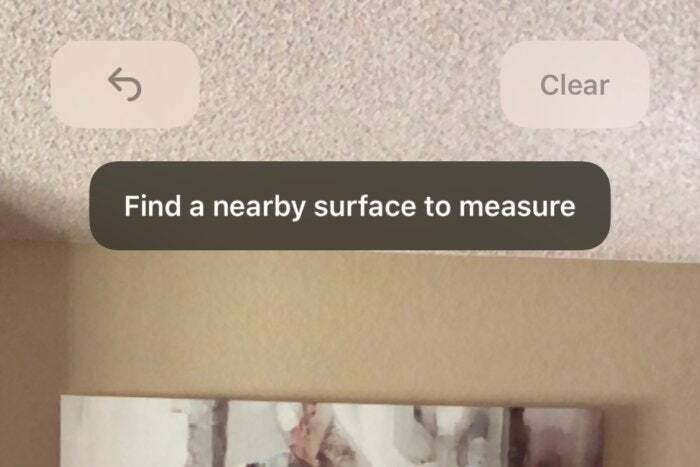 Your phone will only measure objects within a certain distance—no further than about 8 to 10 feet, depending on lighting—so if you see a prompt that says “find a nearby surface to measure” you should step closer. If you see this message, you’re probably too far away. When you’re close enough, you’ll see a small dot in the center of the screen. Tap the + button to add a point. Then simply move your phone until the line stretches as far as you like—it will “snap” to corners—and press the + button again. The measurement will show in the center of the line. You can tap the + button on an existing point to add another line, continuing until you have all the measurements you like. Just move your phone until the center dot is at the point you want to measure and tap the + button. Once you have taken any measurement, the circular shutter button (next to the + button) will light up, making it easy to take a screenshot containing your measurements. If you’re close enough to a medium-sized rectangle, the Measure app will automatically recognize it and highlight it in yellow. Just tap the + button and it will measure the entire rectangle, including the length of each side and the area. The Measure app can automatically recognize some rectangles and calculate their dimensions and area. The Measure app even has a built-in level. Two, actually. Tap the Level icon to enter the level mode. If you’re holding your phone horizontally (facing up or down), you’ll see two circles and a number showing how many degrees off-center you are. Just tilt your phone until the circles align and the screen turns green. The Measure app has built-in horizontal and vertical levels. Turning your phone vertically switches automatically over to the vertical level. You’ll see a horizon line and a number showing how off-level you are. Tilt your phone until it’s level and the screen turns green. You can toggle the background between black and red by tapping it. You’ll find that it’s not uncommon for measurements to drift a tiny bit, or to seem to float in front of the object you’re trying to measure. This is especially true in poor lighting. Fortunately, after a measurement is taken, you can move your iPhone until any point is in the middle of the screen, tap and hold on it, and drag it a little to make corrections. The best way to improve the accuracy of Measure is to start off in a well-lit area. Make sure there’s plenty of light before you open the app and go through the process of moving it around to orient it. Measure also works best when you place points at areas of high contrast or sharp corners. Finally, remember that Measure is meant to give you a sort of ballpark figure. It might suffice for those “will this object fit on this shelf” moments, but if you need real precision, or if it’s a close call, you’ll want to break out the tape measure to be sure. 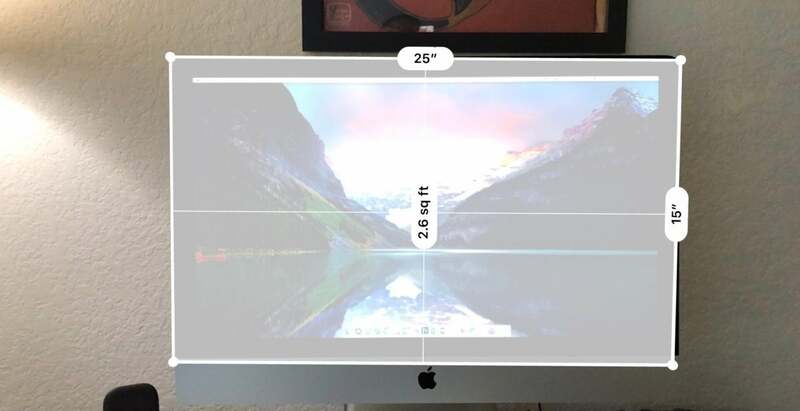 This story, "How to use the augmented reality Measure app in iOS 12" was originally published by Macworld.